We meet for a pre-trip meeting at 7:00 PM the night before your trip at the OARS Warehouse in Vernal. This is an opportunity to meet your fellow travelers and guides, as well as ask any last-minute questions. Your guides will give you a thorough trip orientation, and then pass out your waterproof river bags so you can pack your belongings that evening. Your days begin with the morning light illuminating the canyon walls with a warm glow. Fresh coffee and tea are waiting for you when you get up; grab a cup, sit back and take in the glory of the awakening wilderness. Once you’ve eaten your fill, you’ll pack up your things as the guides break down camp, then our new day’s adventure begins. Much like the past evenings, we’ll make camp on the river’s edge that likely allows access to a great hiking trail. If our guides don’t arrange a hike, you may want to enjoy a self-guided walk, or perhaps you’d rather just relax and wait for dinner – always a trip highlight, as our day’s adventures stir up a hearty appetite. The group dynamic of our trip is at its best as we gather around the campfire for nighttime conversation and laughter. *DNM entrance fee is refundable only if a park pass is submitted to your Adventure Consultant prior to your trip departure. On the final day of your river adventure, you will be returned to the OARS Warehouse. You should arrive back by approximately 3:30-5:30 PM. Geology: Take a river trip through time! Explore some of the oldest exposed rock in the world, along with the remnants of various life forms that existed long before humans with the expert guidance of a professional guest geologist and knowledgeable OARS guides. 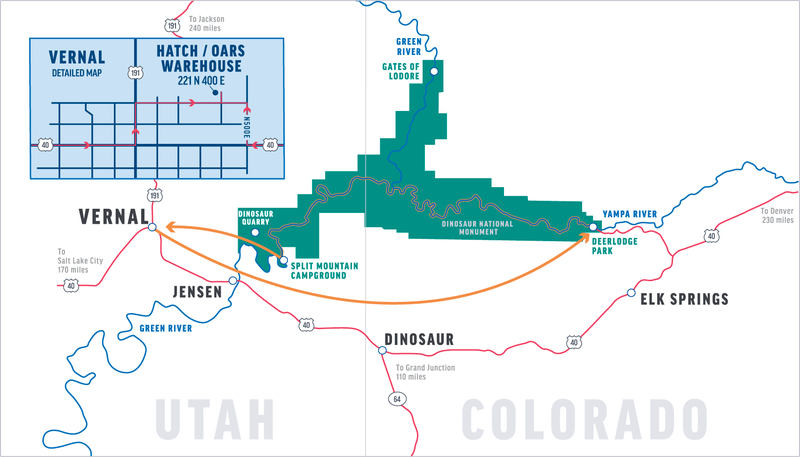 Fishing is permitted on the Yampa River, but be advised that water clarity is not great in Dinosaur National Monument. Fishing is best in Utah below the confluence with the Green River at Jones Hole. You can obtain a Utah fishing license at www.wildlife.utah.gov/fishing/ or at the Vernal Wal-Mart (435) 789-9784, which is a 5-minute drive from the OARS warehouse. If you would like to fish while still in Colorado, you can obtain a Colorado fishing license at cpw.state.co.us. You need to bring your own fishing gear. Please bring your rod in a protective hard case. *The use of drones is prohibited by Dinosaur National Monument on the Yampa River. Fire activity frequently impacts the air quality on our trips, and occasionally wildfires may be present in the immediate vicinity of where we’re traveling. Smoke impacts are more likely in the latter-half of the summer season, so those with asthma or other respiratory conditions may wish to steer clear of this time frame. In general, we will not cancel a trip on account of smoky conditions, except in cases of clear danger to life or property. Necessary changes to logistics and/or destination may occur with very short notice as fire conditions are constantly changing. We will do our best to keep you apprised of excessively smoky conditions that can be foreseen for your upcoming trip, but we also encourage you to stay informed about local fire activity: inciweb.nwcg.gov. May and early-June Trips: These are surely some of the most beautiful months to be on the Yampa river, but they can also produce some surprisingly chilly times. During the fall, the sun is not far enough north in the sky for its warming rays to reach down into the river canyon for as many hours a day as it does in the summer. This means more shady areas, fewer sunny ones. Therefore, when you are splashed (drenched) going through the rapids and you’re in a shady area, you will get very cold unless you are prepared. At the pre-trip meeting each person will be given two large waterproof bags (approximate sealed size: 13” diameter x 25” tall; 3318 cu in; 54.4 L). One bag will be for your clothing and personal items; the other bag will be for your sleeping gear (sleeping bag, sleeping pad, ground tarp, sheet and pillow). These two bags will be your “checked luggage” and will only be accessible in camp. Tents are stowed separately. Please note: if you rent our sleep kit, it will come already packed in one of the 2 waterproof bags issued to each passenger. We also provide a small waterproof bag for day use where you can keep items such as rain gear, camera, sunscreen, lip balm, etc. (approximate sealed size: 17” tall x 9” diameter; 1081 cu in; 17.7 L). The bags are cylindrical in shape and pack from the top. Please pack light, and keep in mind that river attire is casual: comfort, convenience and boat space take precedence over style. At the end of the trip, you will return to Vernal with your waterproof bags, where you will be able to unpack your gear before your trip home. We recommend you take on the river only what’s absolutely necessary. Keeping gear to a minimum insures it will fit into the waterproof bags we supply and reduces unnecessary packing and unpacking in camp. If you do have extra luggage you will need to store it in your vehicle, you may check with the trip leader about storing small items in the OARS office.